Four French lawmakers have been slammed by their government and one of them threatened with sanctions and suspension after an unauthorized meeting with Syrian President Bashar Assad in Damascus as well with a Hezbollah member. The group of four cross-party lawmakers, identified as Gerard Bapt, Jean-Pierre Vial, Jacques Myard and Francois Zochetto, went to the Middle East on a ''personal mission to see what is going on, to hear, listen." According to the Syrian state news agency, Assad and the French lawmakers discussed developments and challenges facing Arab and European nations, especially those pertaining to terrorism. "We met Bashar al-Assad for a good hour. It went very well," Jacques Myard, an MP from the opposition UMP party, told AFP but refused to give details. The lawmakers also met with Hezbollah’s international relations officer, Ammar Musawi, in Beirut on Wednesday. According to the statement, Musawi called on countries to combat terrorism and fight against extremist groups and also to stop helping fundamentalist groups. The visit, which was not authorized by the French government , triggered harsh condemnation. "I fully condemn [this visit]. Assad is not an authoritarian dictator, he is a butcher," Socialist Party Chairman Jean-Christophe Cambadelis has told RTL radio as quoted by Reuters. "I have written to Gerard Bapt, I will summon him and take sanctions." Bapt as well as Vial are presidents of the France-Syria Friendship Group in the French parliament. It has, however, been reported that Bapt was not present at the meeting with President Assad. Reuters says Bapt personally confirmed that in a text message to the news agency. President Francois Hollande slammed French lawmakers for meeting with Syrian President Bashar Assad, whom he branded a "dictator." "I condemn this initiative. I condemn it because French lawmakers have taken it upon themselves to meet with a dictator who is the cause of one of the worst civil wars of recent years," Hollande told reporters on an official trip to the Philippines. Hollande has also said he supported and encouraged sanctions against all four members of the delegation. Prime Minister Manuel Valls said the visit was “a moral failing" and compared Assad to a butcher, hinting at atrocities committed by governmental troops. 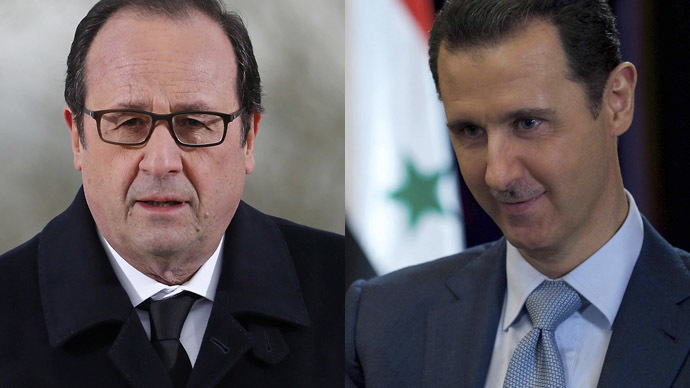 France cut diplomatic ties with Syria in 2012 and now supports the Syrian opposition, seeking the removal of Assad from power. However, recent reports suggest more countries and politicians are considering re-engagement with Assad's regime. Thus, according to Reuters, numerous European countries, including Austria, Bulgaria, Denmark, Romania and Spain are now leaning toward rapprochement with Syria. The report suggested that even in those EU countries that are officially opposed to renewed relations, there is talk that the Syrian crisis could have been handled better. One senior French diplomat admitted that closing the embassy was a mistake, the news agency said. The gradual change in attitude toward Syria, the news agency noted, has gained pace since Islamic State (also known as ISIS or ISIL) made territorial gains in Syria and Iraq, prompting US-led aerial attacks on ISIS positions in the country – despite harsh criticism from Damascus, which accused Washington of violating its territorial integrity.